Even though I love to fiddle around on the computer with my blog's html, I am by NO means an expert in the area. I am fortunate to remember to save my current html...otherwise I'd have caused myself some serious harm on more than one occassion. And while I can figure things out and it all makes sense in my head, trying to explain it to others can be a little bit of a problem. Because you probably don't want to hear, "Click on that little thingy and then blah, blah, blah." That would about sum up my technical instruction. And if I had to teach computer science to my kids? That could be seriously comical. Recently I received an e-book from Motherboard Books called Let's Make a Web Page and it is specifically geared toward teaching 8-12 year olds how to design their own web page. 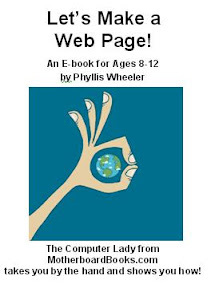 Phyllis Wheeler has written several computer science ebooks for homeschoolers and they are simple enough that kids (older than 10) can work through the steps on their own, with little help from parents. You do need to download a free trial version of Coffee Cup html editor (for Windows) to use the e-book exactly following her instructions, so be sure to read through steps first before downloading and starting, since it is only a 30 day trial of the software. Motherboard Books also is offering a free internet scavenger hunt if you sign up to join their newsletter. It is a mini internet lesson that introduces your child to the internet. Let's Make a Web Page is usually $29.99 but is currently discounted to $19.99 as a special. Motherboard Books also offers a 30 day money back guarantee, so you can't go wrong with this purchase! If you would like to read some other reviews on Motherboard Books, head over to the Homeschool Crew blog. This looks great. I'm going to check it out! Also, when we get back to homeschooling after Christmas I'm going to join in on your preschool corner! I'm excited about that. I LOVE your ideas!! Bless you!